This entry was posted in Gardening, Home Improvement. Bookmark the permalink. Gardening is serious business. From pulling weeds to figuring out which plant needs what kind of sun exposure, you can spend a lot of time stressing over a hobby that is supposed to relax you. If your thumb isn’t as green as you’d like it to be but you still seek the joy that comes from creating a quiet oasis, consider a building a Zen garden. 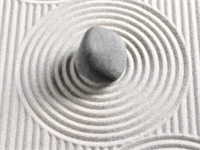 The whole point of a Zen garden is to assist in meditation. These Japanese gardens were traditionally found in Buddhist temples. Most Zen gardens simply consist of clean, white sand and some rocks. The act of raking the sand and moving the rocks around is supposed to be calming. Your Zen garden can be any size or shape you desire. You may choose to have one inside or outside. You may choose to make yours miniature – such as the gardens you may have seen on the desk of a busy executive. You may even choose to turn your entire back (or front) yard into a serene landscape. What makes you most happy? Start there. If you choose to create a mini-garden, you may use supplies you already have on hand, such as a wooden tray or popsicle sticks to build your container. For outside spaces, choose whatever you want to outline and contain your garden – from stone walls to railroad ties. If gardening outside, be sure to lay down thick weed-proofing, such as a plastic tarp. The predominate element of a Zen garden is the sand. Begin with sanitized, white sand. This you may purchase at a home and garden store. You want your sand to be at least two inches deep, and the deeper the better to facilitate raking. Place these objects carefully and thoughtfully. As you learn to meditate and enjoy the properties of your Zen garden, you may often move these objects for a better flow of energy. The best thing about planting a Zen garden is that you don’t actually plant anything, if you don’t want to. Traditional Zen gardens do not contain any plant life whatsoever. If you do choose to add a few plants, they should be meaningful and placed according to your sense of peace. Keep them at a minimum. Bear in mind that sanitized sand cannot support plant life, which means that you will need particular planning (and deeper digging) or you may use planters buried in the sand. The biggest part of the meditative process of Zen gardening is utilizing a rake to make patterns or “waves” that represent soothing water. The repetitive nature of raking allows you to quiet your mind. As you rake the sand into different configurations, use the motions to lull you into a place of peace. As for the rake itself, there are many options. If you made a tabletop-sized garden, you may use a rake made of anything from glued dowels to a dollar-store backscratcher. If you opted for a yard-sized garden, choose any type of lawn or garden rake that feels comfortable to you. Of course, most home and garden stores sell bamboo rakes specifically designed for Zen gardens of all sizes. Just remember that you want to relieve stress in your garden, so don’t add anything that you won’t enjoy maintaining. Ultimately, the goal is to create a space where you feel serenity. You want to be able to clear your mind and focus inward. Be careful not to allow your oasis to become cluttered or crowded. Remember, this is your peaceful space, no one else’s.